Waste Management, Inc. (Houston, TX) CEO David Steiner spoke to CNBC's Jim Cramer about the company's natural gas initiatives. Currently, the company operates 1,400 compressed natural gas (CNG) vehicles but hopes to have all 30,000 of them run on CNG in the future. Over the next five years, 90 percent of new vehicles purchased will run on CNG. With $1.99 per gallon of CNG compared to $4 per gallon diesel, the spread between the two is at historical highs. For Steiner, CNG makes economic sense. His CNG trucks generate virtually zero particulate matter, reduce greenhouse gas (GHG) emissions and generate much less noise. That is good for the environment and especially important when operating in the big cities where pollution is linked to asthma and where reduced noise is an important benefit for trucks operating at night. The other benefits of CNG are manifold including reduced dependence on foreign oil in favor of a domestic resource, including methane from waste in the company's 270 landfills. Right now Waste Management is displacing the use of about 8,000 gallons of diesel per truck per year by using CNG. Steiner boasted about the company's Altamont landfill in California where the methane is converted into liquefied natural gas (LNG) which is fueling the local fleet, the very trucks that are collecting the waste in the first place. He described the whole process as an environmental closed loop. As the company expands its fleet, it will build about 50 CNG fueling stations throughout the US to create the infrastructure, not just for Waste Management trucks, but for other public and private fleets as well. The volatility of gas prices is a concern though. Steiner explains that oddly enough, the price of electricity is tagged to natural gas, and since the company operates a network of 17 waste-to-energy plants that benefit when electricity prices rise, the company has a hedge against rising gas prices that increase fleet operating costs. 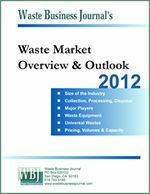 Finally, Steiner indicated that the CNG story parallels that of waste management over the last five years. Which is "how do we extract value out of the materials we gather every year? You put them in a can and call them garbage. We take [it] and say how do we convert this into something with higher value? We look at it as materials that feed our business, that make us money and save the environment." To watch the video, visit: www.cnbc.com/id/15840232?play=1&video=3000084592. It's green week at NBC universal in anticipating of earth day this weekend. For once there, is a reason to celebrate. for years, I've been waiting for the federal government to use natural gas as a cleaner, cheaper, and domestically abundant bridge fuel for cars and trucks, and I've been disappointed by Washington. But huge private sector companies are saving the environment to switch natural gas vehicles without any subsidies for the simple reason it saves them a fortune. Waste Management, the largest waste disposal company in the United States. I like the stock forages, the management's consistent execution and juicy 4% yield. They have taken the lead in the natural gas switch. They have 1,400 trucks fueled by compressed natural gas and 80% of new truck purchases will be powered by natural gas. This is a practical company, they make something out of nothing or electricity out of trash via 17 waste energy facilities. In 2009, solar power, the whole shooting match, produced just over 800,000 mega watt hours of energy. But the waste energy business 6 million mega watt hours. More than 10,000 times as much as all the solar panels in America. I talked to David Steiner on location at one of his company's natural gas fueling stations. Q: it was an eye opener. 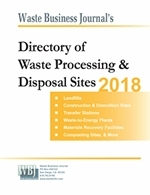 Of all of the companies we follow, waste management is the most committed to using natural gas as a surface fuel for vehicles, talk to me about the benefits, why you have done it, and why are you a pioneer and others should follow? A: you know, Jim, the spread between natural gas and diesel is at historical highs, so from an economic sense it makes good sense. But for us, it's more than that, right? You get virtually zero air particulates, a reduction in greenhouse gases and a quieter operating vehicle. So what's good for our business also happens to be good for the environment. And that's what we're all about. Finding ways that we can do things that are both good for our business, but also good for the environment. Q: Now, I've been trying to explain to people that you in particular have an inner city based business. not just about the cost. but you fight -- I know in New York, there is inner city asthma, diseases, have you been able to cut back on possibly being linked to those kinds of things. A: Absolutely. again, virtually zero air particulates and we're headquartered in Houston and there's obviously a big drive in Houston. places like New York City. not only are those zero air particulates, but these are loud trucks that are operating very early in the morning, so having a quieter truck is a good thing too. Q: that's not one of yours. A: That's an arrival. wrong color. Always look for the green truck, Jim. Q: i'm looking at $1.99. Everyone in this country is saying you cannot reduce -- all the politicians, there there's no way to do anything to reduce the price of fuel in this country. i'm looking at $1.99. that's actual dollars. A: $1.99. somebody said you're filling gas for $1.99. can i fill my car up? it's a different kind of gas, CNG, not the type that goes into your car. 1.99 per gallon in comparison to $4 per gallon, you can see the benefits. Q: That's why you have committed 80% of new vehicles? A: probably higher than that 90%. the only time we'll put a diesel fuel truck on the road where we can't get access to the fuel some of we're building -- we'll build about 50 of these stations throughout the united states to build the infrastructure, but you can see this say public pump. this is not only for our fleet but other public and private fleets to use compressed natural gas. Q: Given the fact you are a pioneer, have other CEOs contacted you about the feasibility and payback? Do a lot of people say, the upfront cost is too much for the pumps and actual trucks? A: Absolutely. one of the greenest companies in the united states happens to be FedEx. i serve on their board, and we're actually talking with them about how they can move more toward CNG. they have a different class of vehicle. they can electrify their fleet. have you forward-thinking CEOs trying to do what's right for the business and right for the environment. Q: waste has a particular production of natural gas. now, at what point does natural gas going down actually hurt the company versus -- can you make it up? A: it's interesting. as we look at our business, more so after the last five years, we have a lot of different commodities we have exposure to. one of them natural gas. we use them to fill 1,400 trucks. hopefully one day all 30,000 of them will run on CNG. oddly enough, the price of electricity is tagged to natural gas. we have a natural hedge there. when prices go up, our fuel costs go up, but we make more at our waste energy plants. a little bit of a natural hedge there. obviously as we move more and more toward a CNG fleet, we have to look for other ways to get that natural hedge to make sure not just natural gas, but commodities, that we are managing them right. Q: Now you're displacing about 9,000 gallons? A: About 8,000 gallons a year of diesel we won't use by using CNG in this particular truck. Q: and most of the fuel in diesel is imported. are you changing foreign oil into domestic independence? A: It's about energy independence for the United States. We are sitting on the Saudi Arabia of natural gas right here in the united states. if we can use it to manufacture chemicals for transportation fuel, we should be using that for electricity, we should be using natural gas for all business. We happen to be the pioneer in using it in the transportation business. Q: are you able to lock in these prices? for instance, I'm not going to point them out. Some utilities say, Jim, are you bullish on natural gas, it could spike to $4 tomorrow. Why don't you lock in the price? How long can you lock in the price? A: it's hard to lock in from a financial point of view for an extended period of time. that's why we're trying to look at natural hedges. with waste energy prices tied to natural gas prices, and we've invested in oil and gas properties to get a natural hedge and our biggest resource, 270 landfills across the united states. only 100 to 120 of them are mining methane gas that we can turn into natural gas right? We have this untapped resource of natural gas. Q: companies making methane are making a fortune right now. A: we do something neat with the methane in California. We have a landfill in the bay area that turns that to liquid natural gas. the very garbage those trucks are picking up goes to fuel those trucks. It's what we call an environmental closed loop. Q: the best clean and green story i know of. last night, the federal energy regulatory commission allowed Chenier to build a $10 billion plant in Plaquemines Parish, but will also export natural gas. we are importing oil in countries that you and i might think are sketchy, a word my kids use and we're exporting natural gas. does that make sense to you? A: we're sitting on a large reservoir. First, we should use it domestically to replace oil. Let's use it to replace coal in power plants and let's use it to replace diesel in our trucks. let's use it to power the chemical plants that, again, down in Louisiana, are using natural gas that -- and moving these industries overseas to get access to natural gas. let's exploit it here in the united states to take advantage of this huge natural resource we're sitting on and create energy independence. as you know, 70% of our oil goes through the strait of Hormuz. why wouldn't we have it go through Pennsylvania? Q: I'm familiar with the contrast. it's not just natural gas, you extract value from a lot of materials. i know from looking at your presentations, have you a big presence in aluminum. 70% of the aluminum ever created is still being used. A: it's the story of waste management over the last five years. which is how do we extract value out of the materials we gather every year? you put them in a can and call them garbage, we take them and say how do we convert this to something with higher value? we look at it as materials that feed our business, that make us money and save the environment. Q: now, got to talk for a second about electric cars. a couple of guys in the business of electric cars. they say we have to be careful. we will never touch their batteries, filled with toxic stuff. recycling nightmare. you are the biggest recyclers in the country. are the worries unfounded? A: it's like anything else, if you don't manage it properly, of course, there is an issue. that's what we're in the business of doing. you're going to need professionals to dispose of those batteries. that's what we do every day. our biggest resource as a company is not the 30,000 trucks we put on the road every day, it's the expertise we've built up in our workforce to know how to manage every type of material you can possibly generate. we can figure out that solution, that's the easy part. i don't think that's any reason at all to not electrify our transportation industry, in the light trucks and personal vehicles. Q: tell me about this facility. Beautiful, but obviously it's brand new I guess, right? Yes. and where do you get the truck engines? These are something like $30,000 to build? A: we have our public pump and that's fast fill. you want to come in, fill up your car or your school bus, or your police car, fut here and it will fill it up just like a regular pump at a gasoline station. on the other side of the fence, we have our slow fuel station. we have 90 trucks that run out of here every day. 60 of them are CNG. you line them up there. come in at night, line them up there, and put in a hose and slow fill overnight. you can get more fuel because it creates more pressure, and you don't have to every day the driver doesn't have to sit and spend 15 minutes filling up the big tank. it saves time, it's good for the environment, and you are able to get that natural gas both into the private fleet and into the public fleet. Q: what a fabulous earth week story. David Steiner, thank you for spending time with us.